Giant inguinoscrotal hernias are rarely found because most of the patients seek surgeons even when presenting small dimensions, asymptomatic hernias. Nevertheless, the difficulty of accessing health services in some regions of developing countries favors the disease diagnosis at an advanced stage and may require care in emergency units. Giant inguinal hernias can cause a reduced life quality, with important social and psychological effects due to the limitations of the daily activities. 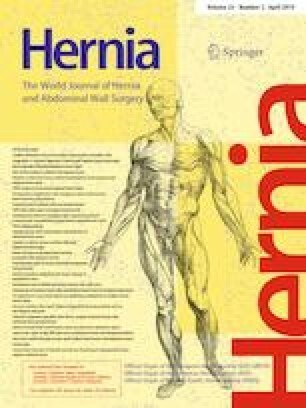 There are few reports of spontaneous eviscerations of abdominal wall hernias, which are usually associated with patients with ascites and submitted to previous surgeries in the region. We present the first case report of a spontaneous evisceration of inguinoscrotal hernia associated with an Amyand’s hernia. Approval from an institutional board review is not required for a case report. Informed consent was obtained from the patient for publication of this case report and corresponding images.